People are invited to envelop themselves in the holiday spirit early with Roxbury’s 4th Annual Home for the Holidays Street Festival to be held on Saturday, Dec. 1. The festival is sponsored and planned by the Township of Roxbury and its Main Street Committee. Hours will be from 11 a.m. to 4 p.m. held on Main Street in Succasunna, sprawling outside on the street, inside the Roxbury Library, and the Methodist and Presbyterian Churches. The beginning of the month is the perfect time to kick off the merriment of the holiday season. Perfect for the entire family, the festival is open to the greater surrounding areas, not just Roxbury residents. Proceeds from this annual festival will be used in conjunction with a grant to complete the installation of Victorian gas lamp style streetlights and brick edged sidewalks on the south side of main street, all part of Roxbury’s Main Street Beautification plan. Attendees can enjoy a myriad of festive delights, all while enjoying the ambiance of the holidays. O’Halloran shares that while many of the vendors and organizations have been with them for years, many new ones have signed on. During this street festival, strolling carolers from the Roxbury High School Classic Sounds Honors Choir will be singing well-loved carols as well as live music from the Roxbury Community Jazz Band, and RHS Band Ensembles. 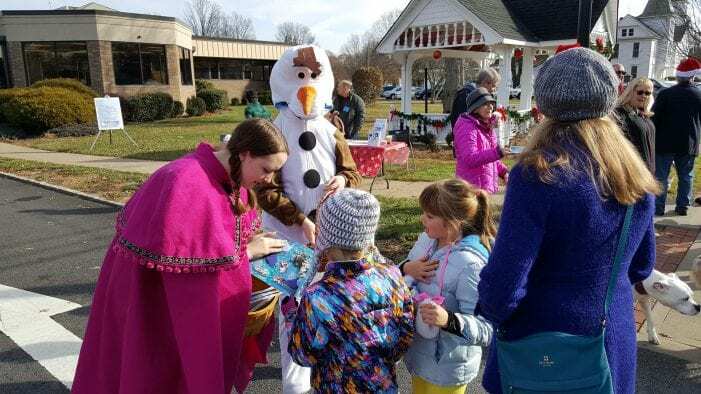 For investigating ideas for holiday shopping or getting it done early, a number of vendors will be selling crafts and merchandise, Roxbury expects approximately 70. To tempt the appetite, food trucks and vendors will be on hand. Joining returning food trucks such as Jersey Rollz and the Empanada Lady will be Cheesn, featuring gourmet grilled cheese; Latin Bites; Charlie’s Movable Feast featuring hot dogs, hamburgers, funnel cakes etc; Foodie Call, gourmet tacos; House of Cupcakes, and Sue’s House Of Fudge with 20 flavors cut to order. Attendees can leisurely stroll along, or they can participate in one of the most traditional staples of the holiday-a carriage ride with horses adorned with jingle-bells! When Santa arrives on the fire truck at noon, he will greet the kids and lead the children into Santa Land in the Library. Held from the hours of 1 p.m. to 4 p.m., kids can get their picture taken with Jolly Old St. Nicholas, hear holiday book readings, and do fun crafts. For a little respite, the Presbyterian Church will be having a bakery café where people can buy delicious homemade treats to take home or sit and eat with hot chocolate, coffee, or tea. And the Methodist Church will offer activities for kids, puppet shows, homemade treats and hot drinks. There will be contests, games, and crafts for kids, as well as Irish Dancers from the Wick Haggerty School of Irish Dance jigging in the street. And capturing that spirit of feel-good nostalgia, the Children’s Choir from Morris County Educare will be singing holiday songs in the gazebo by the library. O’Halloran shares that already everyone is extremely excited for this year’s festival, and she is eagerly looking forward to it herself. For further information, visit http://www.roxburynj.us/holidays.